The amount of 1.38 USD has been deposited to your account. Accounts: U17657766->U1651590. Memo: API Payment. Withdraw to IncredibleEarnings from TERRAINVEST-LTD.. Date: 11:46 20.02.19. Batch: 247244527. The amount of 1.38 USD has been deposited to your account. Accounts: U17657766->U1651590. Memo: Shopping Cart Payment. 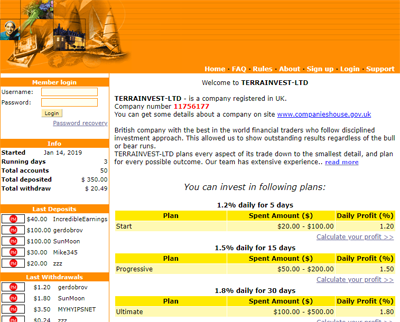 Withdraw to IncredibleEarnings from TERRAINVEST-LTD.. Date: 12:04 21.02.19. Batch: 247390058. The amount of 1.38 USD has been deposited to your account. Accounts: U17657766->U1651590. Memo: API Payment. Withdraw to IncredibleEarnings from TERRAINVEST-LTD.. Date: 17:06 22.02.19. Batch: 247568980. The amount of 1.38 USD has been deposited to your account. Accounts: U17657766->U1651590. Memo: API Payment. Withdraw to IncredibleEarnings from TERRAINVEST-LTD.. Date: 05:09 24.02.19. Batch: 247733781. The amount of 2.28 USD has been deposited to your account. Accounts: U17657766->U1651590. Memo: API Payment. Withdraw to IncredibleEarnings from TERRAINVEST-LTD.. Date: 03:15 25.02.19. Batch: 247846536. The amount of 1.38 USD has been deposited to your account. Accounts: U17657766->U1651590. Memo: API Payment. Withdraw to IncredibleEarnings from TERRAINVEST-LTD.. Date: 11:50 26.02.19. Batch: 248041841. The amount of 1.38 USD has been deposited to your account. Accounts: U17657766->U1651590. Memo: API Payment. Withdraw to IncredibleEarnings from TERRAINVEST-LTD.. Date: 14:31 27.02.19. Batch: 248215736.